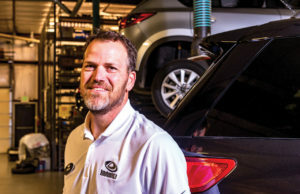 Chris Donohoo, owner of DonohooAuto in Pelham and Donohoo Chevrolet in Fort Payne, was center stage at year’s UAB Excellence in Business Awards sharing his deep regard for the university and his non-traditional drive to success in business. Donohoo has twice been recognized for UAB Excellence in Business Top 25, most recently in 2017 for “Fastest Growing Company – Over $10 Million” with impressive growth of 53 percent. And his customers concur, based on the level of repeat business and the trajectory his career has taken in a surprising twist on his original ambition. Donohoo’s road to success wasn’t a path he anticipated as a standout member of UAB’s baseball team and later graduate assistant under Coach Gino Giangrosso. While he was preparing for his own career in coaching, Donohoo decided to sell a used car for extra income. He and his wife were just starting their family, and it seemed the prudent thing to do. Donohoo says he was a strong student but not valedictorian material. Instead, the thing that set him apart was his decision-making skill. He says his two-year stint bartending was also helpful in giving him insight into what it takes to lead. Donohoo says his wife, Denise, deserves equal credit for the business success, working with him from the beginning whether on paperwork or delivering cars with two babies in tow. He looks forward to sharing his unique story and his gratitude for what UAB has meant to him in building a business that now includes both his brother and father. The catapult began with turning around that one used car via online advertising. After his first, surprisingly easy sale, Donohoo’s small-scale interest expanded, and he applied for his state retail license. During his first year, he sold 25 autos, turning them around as quickly as he could buy and market them. A picture of the 1991 black Ford Taurus, the one he sent to the state to acquire his license, hangs in his Pelham office as a reminder of humble beginnings. It was one of the first cars actually purchased at auction. After his first year in business, Donohoo received a capital infusion from New South Federal and doubled his inventory by the end of 2003. He had been renting a small lot on Birmingham’s Southside, selling most vehicles online via Ebay or Yahoo Auctions. In 2004, Donohoo made the move from his $500-a-month rental lot to a larger lot in Pelham. But it was in 2005 that Donohoo says he made his smartest move in asking his brother, Pete, to join him in the automotive sector. The Donohoos purchased an adjacent property for the business in 2006. In 2008, he added the current facility that specializes in luxury names like Lexus, Infiniti, Audi and BMW at price points from $5, 900 to $100, 000. With word-of-mouth advertising boosting traffic flow companywide, DonohooAuto will soon celebrate its 10th anniversary in its current location and 20th anniversary as a company. In 2013, Chris and his brother, Pete, purchased a Chevrolet dealership in Fort Payne, taking the business to the next level and more than doubling the number of employees in only a few years at the helm. Donohoo’s business acumen, combined with an information explosion on the web, fired like a combustion engine to launch his automotive career. Cara Clark and Joe De Sciose are freelance contributors to Business Alabama. Both are based in Birmingham.